One of the more beautiful Florida Keys diving sites is the City of Washington Wreck. The remains of this vessel lie in shallow water at a maximum depth of 25 feet making her perfect for Florida Keys snorkeling. She also lies about 550 yards northeast of Elbow Reef lighthouse. This proximity to the lighthouse makes this one of the better Florida Keys shipwrecks for night diving. If you're planning dive trips out to this wreck, you'll find that she lise withing easy diving distance of Mike's Wreck now confirmed as the Hannah M. Bell, and the Tonawanda. 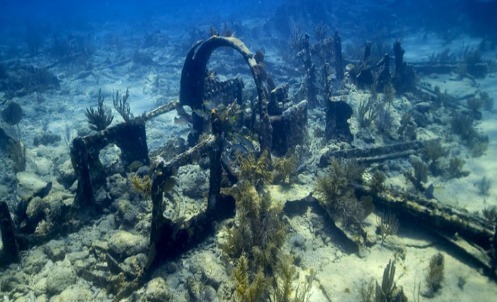 Both of these vessels met a similar fate on deadly, but beautiful Elbow Reef which is another major drawing card attracting divers to this Key Largo snorkeling and diving site. Built in 1877 she had a length of 320 feet, a beam of 38 feet, and sported 3 decks with the ability to carry 400 passengers and crew members. This schooner was originally fitted with a compound surface condensing engine which in 1889 was changed out for a more powerful triple expansion steam engine. She was also rigged as a hermaphrodite brigantine. 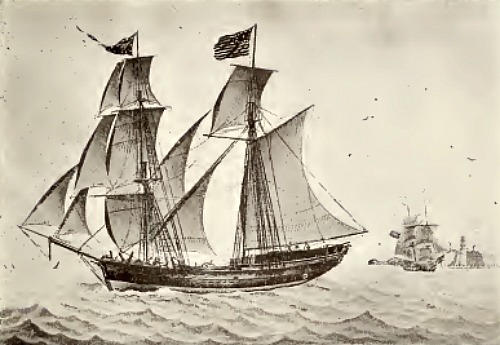 This style, with it's square rigged foremast and it's fore-and-aft rigged mainsail, was a style highly favored by pirates because it required less manpower to operate. "The Sailing Ships of New England 1607-1907"
In the non-pirate world, this style of rigging was a bonus since it meant less paying hands were needed to smoothly sail the ship. Between her engines and her sails, this ship was considered to be a fast vessel, and she held an impressive record of sailing from New York to Havana in just 73 hours. Unlike so many of the other ships who foundered on the Florida reefs, this vessel enjoyed a relatively long and illustrious career. She spent much of her life traveling back and forth from New York to Cuba, Mexico and Panama, shuttling both cargo and people. In 1898 she was involved in a major maritime event when the USS Maine exploded near her in Havana's Harbor. Suffering only minimal damage to her deck house and lifeboats, she and the Alfonso XII rescued 100 of the approximately 360 crew members aboard the fiery USS Maine. To help with the treatment and care of the injured sailors, her dining salon was turned into temporary hospital quarters. This incident set the stage for the beginning of the Spanish-American War. After numerous hearings, it was eventually determined that the USS Maine had exploded due to a Spanish submarine mine. With public outrage and sentiment leading the way, on April 20, 1898, Congress stepped in and declared war on Spain. During the Spanish-American War, the US Army Quartermaster Department was responsible for securing merchant vessels to help with the transport of troops and material to the war front. The City of Washington was duly hired and served from April - September 1898. Released from military duty she returned to plying the waters ferrying passengers and cargo until her retirement in 1908. It was in 1911, with her glory faded, that she was purchased, stripped and began her final career as a coal barge. Her fateful day arrived on July 10, 1917. She and the Seneca were being towed by the Luckenback 4, when all foundered on Elbow Reef. The other two vessels were able to be refloated on July 15, but history tells us that she sank in two minutes. A rapid end to a vessel that had successfully dared the treacherous waters and the Florida Keys reefs for many years. The City of Washington Wreck is a very popular Florida Keys snorkeling and night diving site since the water's clear and she's relatively close to the Elbow Reef lighthouse. Considering that her hull is split open and she has a debris field scattered over 325 feet, this ship is still in reasonable condition. When Key Largo diving, some of the favorite features you'll want to explore are her propeller shaft log, hull plate with portholes, bilge pump assembly, bow mast section, deck ladder, and her top rail. The only downside is that diving into the wreck is not possible, but there are numerous discoveries to be made around her. Elbow reef is another reason why the City of Washington Wreck is such a popular Florida Keys snorkeling and dive spot. Elbow Reef is known for it's varied population of colorful coral and tropical fish. Reefs also serve as nurseries for juvenile fish so you'll encounter an abundance of younger game fish, along with the ever present lazy nurse sharks, patrolling barracuda and cave dwelling eels. 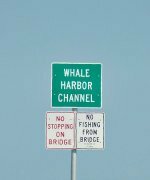 Elbow reef is such a popular Key Largo diving area that the traffic is obviously heavy at times. This means the fish are very used to seeing humans, and some have become rather spoiled, even taking it for granted they're going to be fed. The barracuda especially have been known to nip at divers fingers while looking for, and expecting, a handout - or hand. The City of Washington was grand in her day, and today, she lies buried in one of nature's most beautiful graveyards. When scuba diving Florida Keys, don't miss out on a chance to visit one of the more beautiful and historic Florida Keys shipwrecks.